Ultra ClearCoat™ optical system: Nikon has engineered the entire optical system to provide the shooter with a bright, sharp, incredibly flat sight picture and light transmission up to its theoretical maximum—95%. 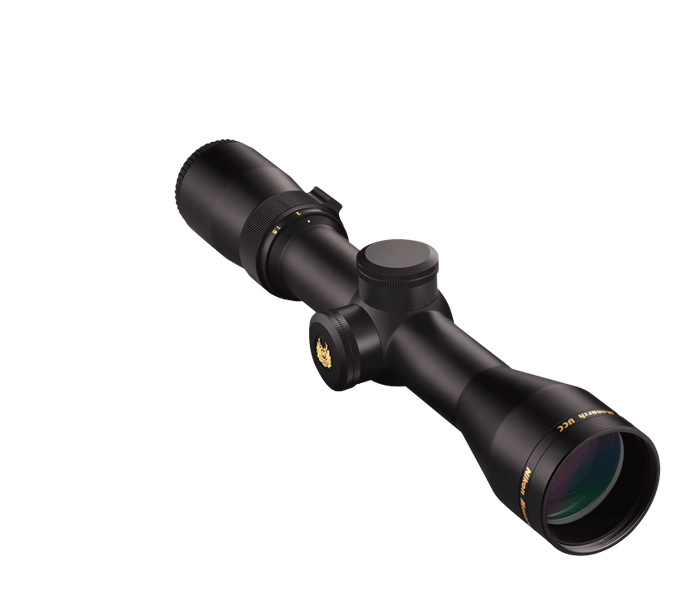 Rugged, one piece 30mm body tubes: Larger tubes and internal lenses allow for maximum resolution, wider windage and elevation travel and superior low-light performance. Milled from aircraft grade aluminum, durability is built into each model. Larger internal lenses: Produce a larger “sweet spot” for enhanced resolution. Four time magnification zoom range: Provides outstanding flexibility for up close-shots as well as long-range canyon-to-canyon shots. Four inches of constant eye relief: Every Monarch Gold assures you of a full four inches of eye relief throughout the magnification range—especially important for hard-kicking magnums. Quick focus eyepiece: Allows the shooter to instantly bring the reticle into sharp focus. Hand-turn ¼-MOA windage and elevation adjustments: Get you zeroed-in quicker and maintain your setting even with heavy recoil.